1盎司2016年迪斯尼Rapunzel公主银币 Disney's Rapunzel character is based on the Grimm Brothers 1812 fairy tale, which itself has striking similarities to folk tales told in the 10th century! The Disney movie Tangled is loosely based on the story of Rapunzel. Walt Disney first tried to adapt the story in 1937, but found it too difficult to do well and the project was abandoned. The story was finally released as Disney's 50th full length animated film, to great critical acclaim. The obverse has the Ian Rank-Broadley effigy of Queen Elizabeth II, while the reverse features a colourized image of Rapunzel as she appeared in the Disney film. 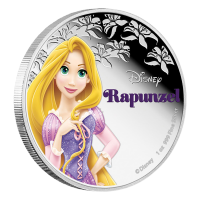 A perfect gift for Disney collectors or Princess fans, the limited mintage of 10000 should lend this coin enduring appeal.